Place safety caps to cover all electrical outlets in your house to keep your tot from sticking their fingers or poking something in there. Make sure all appliances are properly put away and out of your curious child’s reach. Emphasize to your kid that these electronics are not toys, no matter how fascinating they look, and thus, should never be played with. Most kiddos in this gadget-centric world own a tablet, game console, cell phone, etc. And are quite addicted to them. Ensure they know that electricity and water or any liquid for that matter, don’t and shouldn’t go together. This means, no gadgets in the bathroom, near the pool and other wet areas and surfaces. 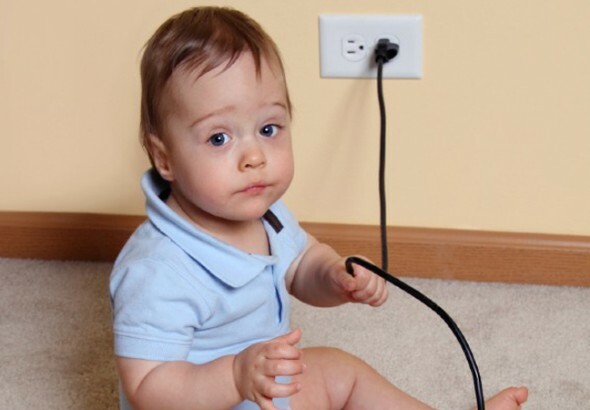 Not only pulling on a cord can damage your electronic, plug or outlet, this bad habit is also very life-threatening—especially for a young child. Educate your kid to always unplug cords directly from the wall outlet. Tuck them away or tie them up nicely out of reach and sight. Your pooch might chew on these and your child might trip and fall from a cluttered cord. You may want to invest on clips and other cord and cable organizers for this purpose. Damaged or frayed cords with exposed electronic parts can cause electric shock and fire. Call a licensed electrician to get them fixed or replaced. Or simply get rid of the appliance.